Andrews McMeel Publishing, 9781449457952, 176pp. Zen Pencils is an exciting and unique new comic form that takes inspirational and famous quotations and adapts them into graphic stories. From icons like Confucius, Marie Curie, and Henry David Thoreau, to Presidents Theodore Roosevelt and Calvin Coolidge, to contemporary notables like Ira Glass, Neil deGrasse Tyson, and Neil Gaiman---their words are turned into sometimes heartwarming, sometimes sobering stories by cartoonist Gavin Aung Than. Be inspired, motivated, educated, and laugh as you read famous words as never before! Gavin Aung Than, an Australian graphic designer turned cartoonist, started the weekly Zen Pencils blog in February 2012. He describes his motivation for launching Zen Pencils: "I was working in the boring corporate graphic design industry for eight years before finally quitting at the end of 2011 to pursue my passion for illustration and cartooning. At my old job, when my boss wasn't looking, I would waste time reading Wikipedia pages, mainly biographies about people whose lives were a lot more interesting than mine. Their stories and quotes eventually inspired me to leave my job to focus on what I really wanted to do. 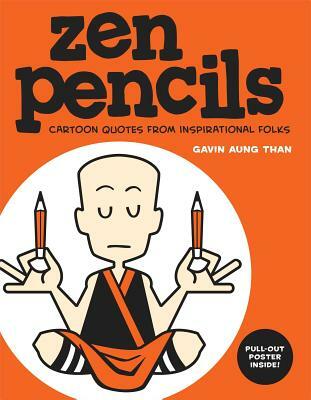 The idea of taking these inspiring quotes, combining them with my love of drawing and sharing them with others led to the creation of Zen Pencils." Gavin Aung Than is a freelance cartoonist based in Melbourne, Australia. After working in the corporate graphic design industry for eight years he quit his unfulfilling job at the end of 2011 to focus on his true passion, drawing cartoons. Gavin launched Zen Pencils at the start of 2012, a cartoon blog which adapts inspirational quotes into comic stories, and hasn't looked back since.